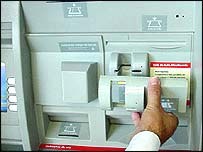 High-tech devices attached to cash machines allowing criminals to clone debit and credit cards have been discovered for the first time in south Wales. It is feared that the machines have been used to gain the details of hundreds of accounts by tricking people in the city last Friday and Saturday into allowing their cards to be copied electronically. Police are warning people to check their statements after the discovery of the devices over the weekend at several banks in locations including Queen Street and St Mary Street in Cardiff, Penarth and Port Talbot. The names of the banks targeted by the thieves have not been disclosed. Thousands of revellers flock to Cardiff every weekend for nights out, stag parties and sporting events, many of whom withdraw cash from machines across the city. In the last week, 15 people went to South Wales Police reporting missing funds from their accounts as a result of cloning - with one man having £3,500 stolen from his account. "This is a very sophisticated way of accessing account details and there is a great deal of concern about it," said Detective Constable Terry Stevens. "The criminals are able to copy the details of the cash cards from the magnetic strips and programme them onto the strip of a donor card which can be used to withdraw money. "This is organised crime by gangs which we suspect originate from London, possibly Eastern European gangs." The device, which is attached to the card slot of the machine, works by recording the details on the magnetic stripe of the card as it passes through. The personal identification number (PIN) is then accessed either by someone watching as the ATM is being used or by secret camera equipment. The criminal can then create a copy of the card by removing the device and using a lap top computer to download the information on to any card with a magnetic strip - a store card for example. It looks exactly like the ATM machines and money is dispensed to customers in the usual way. As well as checking statements, Mr Stevens urged people to be vigilant when using cash machines. "Be wary if the card slot on the ATM seems unsecured or protrudes unusually, or if there is anything unusual attached to it that wasn't there before like a small bin," he said. "And alert the bank to anything which looks suspicious." Anyone who believes they may have been affected should report any suspicious withdrawals to the police and their bank immediately who will be able to check if their cash card had been cloned. Does my card cover me for online fraud?